New York City is making progress in strengthening the condition of its branch libraries, but the latest capital needs figures reveal that there is still much more work to be done. The mayor and the City Council should continue what they've started and fully fund the city's three library systems to bring their aging infrastructure to a state of good repair. Over the past two years, New York City has made crucial progress addressing the serious infrastructure needs facing its 207 branch libraries. Mayor Bill de Blasio and the City Council significantly increased city investment in libraries, boosting expense funding by $43 million in FY 2016 and adding $300 million for libraries to the city’s Ten-Year Capital Strategy. But although this influx of public funding has helped reduce the capital backlog, a new analysis by the Center for an Urban Future shows that the city’s three library systems still face at least $947 million in capital needs just to bring their branches to a state of good repair. There’s no question the libraries have made progress. Four years ago, the Center for an Urban Future released a report documenting $1.1 billion in capital needs across all three systems. The report highlighted significant state of good repair problems—from malfunctioning mechanical equipment and leaky roofs to overburdened electrical systems and a lack of accessibility for older adults and patrons with physical disabilities—and showed that 59 branches citywide had at least $5 million in capital needs. But while many of the most urgent infrastructure problems are now being addressed, this analysis shows that the capital needs currently total $947 million. This includes $400 million at New York Public Library (NYPL), $319 million at Queens Library (QPL), and $228 million at Brooklyn Public Library (BPL). The libraries also continue to cope with enormous emergency capital needs. In fact, our analysis shows that the three systems have urgent capital requirements of $434 million. Although this is down slightly from 2014, when emergency needs totaled $440 million, these immediate liabilities remain substantial. They include $176 million at NYPL, $172 million at QPL, and $86 million at BPL. Given the age of the system and increasing use, it should come as no surprise that these needs are so significant. The average New York City library is at least 62 years old, and Manhattan and Brooklyn have 40 branches that have been in service for more than a century. In a city where more than half of the 207 branch libraries are over 50 years old and a quarter were built at least a century ago, state of good repair needs will continue to escalate as boilers break down, roofs leak, and structures decay. In the years ahead, it will only become more critical for the city to address these mounting needs. In addition to the challenges posed by aging infrastructure, libraries are also experiencing record-high attendance for public programs, such as early literacy, technology training, ESOL, job skills, and classes for older adults. To meet this growing demand, the city’s public libraries need branches that are spacious, flexible, and equipped with modern technology. Achieving this will mean not only closing the state of good repair gap, but also investing in reconfigured layouts with more seating and outlets, additional spaces for classes and workshops, and new facilities ranging from music production studios to technology labs. But in order to meet these goals, the city’s libraries will first need the resources to address the urgent capital needs that are still widespread throughout the systems. A closer look at the library systems’ current needs and recent capital work reveals that although substantial progress has been made, significant needs remain. Overall, the total capital needs of the three library systems have decreased by $158 million (14 percent) since 2014, but still totals at least $947 million. Emergency capital needs have decreased by $6 million (1.4 percent), although critical needs of at least $434 million still remain, as some existing problems have worsened and new issues have emerged. NYPL is undertaking comprehensive renovations at five century-old branch libraries (125th Street, Fort Washington, Hunt’s Point, Melrose, and Port Richmond) found to be in most critical condition, and making additional repairs and upgrades at the Macomb’s Bridge and Van Cortlandt branches. 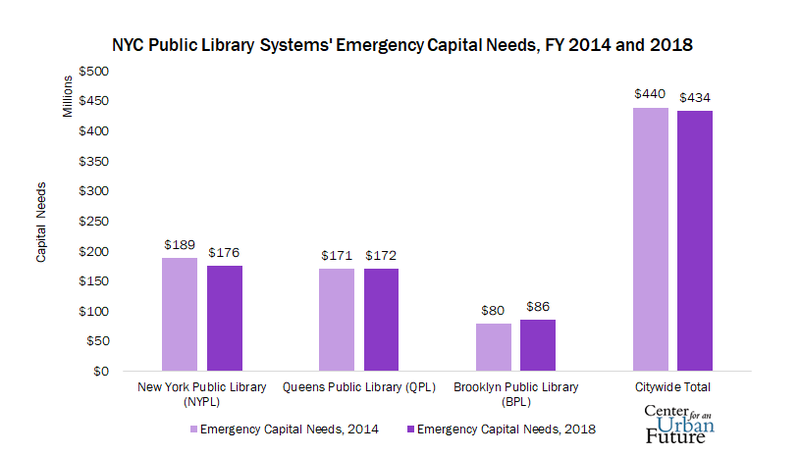 However, NYPL has also identified $176 million remaining in critical needs, including $78 million in the Bronx, $70 million in Manhattan, and $27 million in Staten Island. QPL has completed several major projects, including the replacement of the Elmhurst Library, an expansion at Kew Garden Hills, the new Flushing Children’s Room and Adult Reading Area, an interior renovation at Ozone Park, and numerous roof and HVAC replacements. QPL is also continuing the expansion of the East Elmhurst branch, replacing the Far Rockaway Library, and renovating the branch in Richmond Hill, while planning more than a dozen other replacements, major renovations, and upgrades. Although the system has made significant progress over the past four years, QPL still faces $172 million in critical capital needs. BPL has launched new partnerships to rebuild or relocate four branches with significant capital needs: Brooklyn Heights, Sunset Park, Greenpoint, and Brower Park. In addition, two new branches are being planned for DUMBO/Vinegar Hill and in Downtown Brooklyn. BPL is also overhauling five aging branches in Brownsville, New Utrecht, Canarsie, New Lots, and on Eastern Parkway. Full renovations are underway at Rugby and about to begin at East Flatbush, with others planned at Red Hook and Borough Park. Within the next five years, over one-third of the BPL system will have received a recent full renovation or will have been replaced—the largest change to BPL’s footprint in half a century. However, BPL also has approximately $86 million in emergency needs, which will have to be addressed in the near term. New York City is making progress in strengthening the condition of its branch libraries, but the latest capital needs figures reveal that there is still much more work to be done. 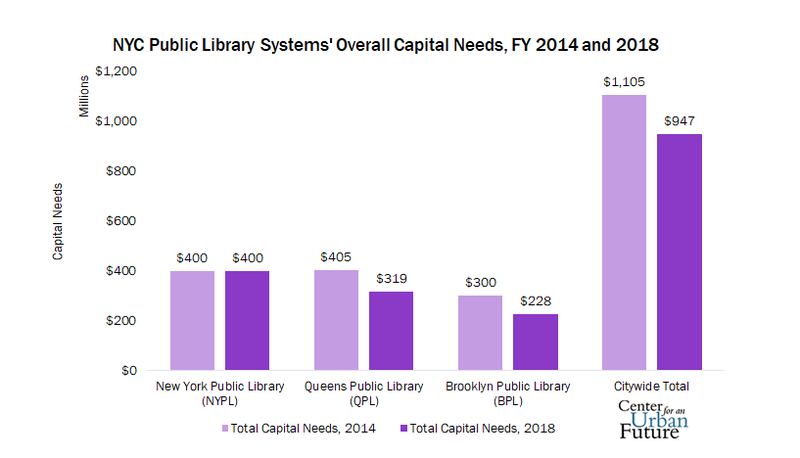 The mayor and the City Council should start by fully funding the three library systems’ capital requests for the coming fiscal year, while developing a plan to meet the remaining capital needs over the course of the next decade. This report was made possible through generous support from the Charles H. Revson Foundation. General operating support for the Center for an Urban Future is provided by The Clark Foundation, the Bernard F. and Alva B. Gimbel Foundation, and Altman Foundation. We are also grateful for support from Fisher Brothers for the Center for an Urban Future’s Middle Class Jobs Project. "New York City’s Libraries Still Face Daunting Capital Needs" was researched and written by Eli Dvorkin.